Do you ever find yourself living your life on autopilot? I think we’ve all experienced this at least once… when we suddenly have a moment of clarity and see how zombified we’ve been for the past number of hours, days, weeks, or even years. With the hustle and bustle of daily life, and the set work-home-sleep-repeat schedule that many of us keep, it’s easy to zone out to the routine. While it makes sense that we would do this (and if it’s a habit, it may be time to start making your life more exciting! ), life is so much richer when experienced mindfully. Without mindfulness, we can miss the important moments while in a haze, or run around so busy and chaotic that we lose connection with ourselves and others. When you take the time to be fully aware of the moment, truly positive things happen. Not convinced? Here are five reasons to start looking where you’re going and embrace the full potential of mindfulness. It sounds trite, but if you’re not making time to take in the sights, smells, sounds, and sensations all around you as you go through your life, you’re probably missing out on a whole lot. This applies to the natural wonder of the outdoors, and also to the scenery of your life in general. Life moves fast, and if you don’t pay attention, you’ll miss the view. When you make a choice to be mindful, you’ll notice a lot of things you’ve probably taken for granted. The way the sun shines on your bedroom walls. The cracks and imperfections in your favorite coffee mug. The way your hair feels brushing against your ears. The trees on your commute to work leaning just a bit in one direction. The folds in your hands. The folds in the hands of your loved ones. These are just a few general examples… look around the scenery of your life and see what you discover. This applies both to physical roads and metaphorical ones. When you’re driving aimlessly, you’re probably not paying attention to how the road feels. Picture a scenario where you’re driving somewhat distracted — alert enough to follow basic traffic safety and avoid collisions, but pretty lost in your head. Do you think you’d be quick to notice a person that needed help, a dangerous situation off to your left, or just something off-kilter about a certain place? If you’re unaware, you may miss a lot. Conversely, if you “keep your eyes on the road” while you go through your life, you’ll be able to sense and intuit much more about the circumstances around you. This will keep you perpetually ahead of — or at least right there with — the game. 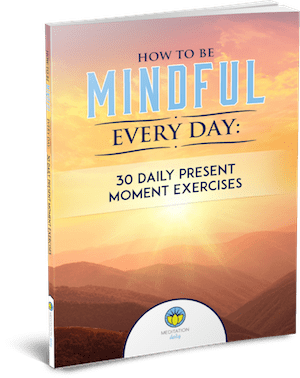 When you’re not mindful of the present and all of the circumstances that a given moment can contain, you’re more likely to miss early signs of trouble. This pertains to any kind of trouble, whether with your career, with a loved one, with meeting a new person, or with your health. When you remain mindful, you start to get a feel of what’s working positively, and what’s affecting you negatively. This can allow you to make subtle adjustments when you need to, before issues build into a huge blowout of chaos. Staying mindful can also help you to detect certain warning signs about people, so that you can approach with caution. The road we travel in life is never straight; there are, of course many twists, turns, and curves along the way. When you’re actually paying attention, you can see some of these curves coming, so that you can better prepare yourself. If you’re too caught up in a sea of thoughts to fully assess your surroundings and the intricacies of your path, you’ll often be blindsighted. To avoid driving around for miles looking for a country road, so to speak, it’s best to stay aware. When you walk through your life the mindful way, you’re bound to notice other fellow humans doing the same. If you decide to extend your friendship to some of them, you may make lasting connections, strengthened by a mutual focus on awareness and the infinite moving present. These connections are rare, but the ones you make you often cherish for life. So, if you’ve been living in a whirlwind of chaos, or with your head too far in the clouds, give mindfulness a try. Start by meditating regularly (five minutes in the morning and five at night is a good start), and make an effort to return your mind to the present whenever you notice it wandering. The more you notice the present, the easier the noticing becomes… and the freer you will feel.